Natural products continue to play a key role in drug development. A recent analysis of the drug market in the developed world revealed that 40% of total clinically approved drugs were either unmodified natural products or their semi-synthetic derivatives. This new series of e-books focuses on exciting new bioactive natural products that have huge potential as drugs. Gomes et al. 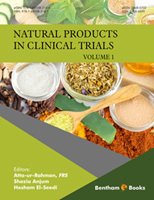 in chapter 1 review the wide range of natural products derived from marine invertebrates that stand out as an important class of natural products with therapeutic potential, some of which are undergoing clinical studies. Moorthy et al. discuss those natural products that are under clinical trials for immunological and inflammatory diseases in chapter 2. Subramani et al. in chapter 3 discuss the clinical trials of curcumin, camptothecin, astaxanthin, and biochanin for various diseases ranging from inflammation to infection. The chapter also deals with lead optimization, formulations and improved delivery systems of these natural products. Currently, there is a substantial decline in new drug development for anti-microbial activities, as many microbes are developing resistance and becoming superbugs. Sangshetti et al. in chapter 4 review new antibacterial and antifungal drugs under clinical trials that are mainly derived from natural sources. Numerous natural product based anti-HIV drugs, such as Robustaflavone, Chamaeflavone A, Longipedunins A, Binankadsurin A, Schisanlactone A, Anibamine, Altertoxine, Betulinic acid, Baicalin, and Hinokiflavone are undergoing clinical trials. These are reviewed in the 5th chapter by Parveen et al. We hope that the readers will enjoy the comprehensive and explicit reviews written by eminent authorities in the field. We are also grateful to the editorial staff of Bentham Science Publishers, particularly Dr. Faryal Sami, Mr. Shehzad Naqvi and Mr. Mahmood Alam for their continued support.